I picked this limb of baby acorns off the ground while gardening on friday. Its been sitting on my painting table just begging to be painted. As you can see I didn’t paint the background, but sometimes I like the starkness of white against a nature study. If I were to put color in, I would probably use one of the colors that are already inthe painting. For you artists here are the colors…. burnt sienna+ sepia, sepia+ sap green, orange lake, yellow green, yellow orange, cobolt blue and burn’t sienna. This entry was posted in A painting a day, art, art sales, Blogroll, painting, watercolor by shanti marie. Bookmark the permalink. dudz.. count me in your blog roll! Got your message, Shanti — yes, of course we can exchange links. Please add my blog to your list and I’ll do likewise. I was just admiring your acorns earlier this morning. Coincidence! Wow! Thanks so much for commenting on my Flickr site, I don’t look at comments there too often, mostly use Flickr to upload images to my blog, so I missed them at first. But what a treat to get the link to your site. Your work is amazing! How large are your daily paintings? I’m going to take a longer visit to your site and will be blogrolling and bloglining it. 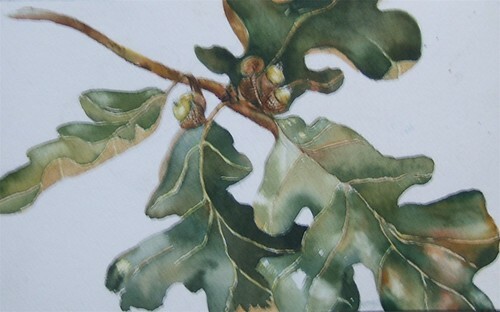 Hi, I really love your Baby Oak painting, thanks for posting it on for all the world to see. Best Wishes, Fleas.